Tensions are as high as ever after the bombing of the Carapace headquarters making things even more difficult for Dana and Aban's investigation. With fewer and fewer options at her disposal, Dana takes some dangerous risks to draw out Renfro but that could be the tipping point of an already shaky alliance with the locals. 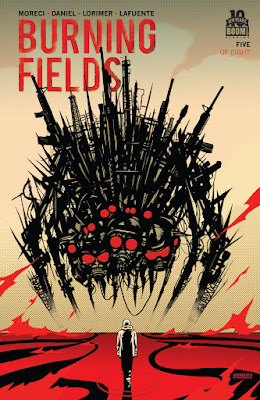 Comic books' best drama, Burning Fields (#5), begins the second half of their run with more riveting storytelling. One of the fascinating things about Burning Fields is that it relies on a character-driven story instead of easily delving deep into the supernatural elements. These mystical forces lie just on the fringe, dabbled in previous issues but never substituted for the real tension among the investigators, the contractors, and the locals. Dana herself carries a ton of baggage as she works with Aban to find the killer. Their relationship is an awkward balance of trust and respect. Yet, Dana still puts up a wall, a stoic exterior that leaves Aban with a lot of questions about who exactly he's working with. He even has to lay it out for her about what stakes each has in this investigation. Michael Moreci and Tim Daniel have crafted a grim political monster tale with broken people more frightening than any creature. I've compared Colin Lorimer to Michael Lark and I still stand by that, but he's carving his own legacy with exceptional work on Fields. The heavy lines, the darkly inked panels, the expressive faces help convey the writers' message but also tells an even murkier reality. It is a dark world both figuratively and literally and Lorimer wants to draw you in, put you shoulder-to-shoulder with Dana and Aban, in a tunnel, in a car and he succeeds. You become as invested as the characters because you recognize the danger that lurks with every move. Lorimer makes sure you're paying attention. Joana Lafuente does her best to inject some color, some peace, into every panel, but there's no room for light, no happiness in a place built on lies and ulterior motives. Lafuente soldiers on with great hues even with a story as heavy as this. If you're looking for chuckles and quippy one-liners you may want to look elsewhere. Although there is a nice timely Jurassic Park reference that works extremely well in context. Burning Fields is a seriously haunting procedural that burns and wallows in the mud looking for a release that never comes. This is a high-grade political thriller that needs to be experienced.